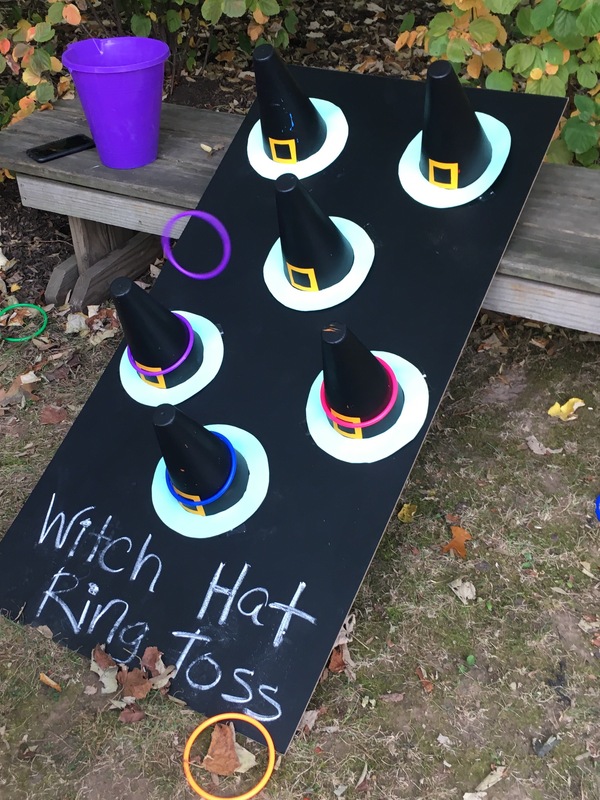 This ring toss game was a hit at our elementary school Harvest Festival. Use a colored foam board or wooden plank for the base. Then make witches hats from construction paper or jut buy some party hats at the party store and paint them black. Keep the ring toss to use every Halloween. 1. Paint the board and party hats black. 2. Cut out squares for buckles from the construction paper and glue to the black hats. Glue the party hats to paper plates. 3. Glue the hats onto the board. 4. Set the board on the ground and use the duct tape to create a line on the ground that the children cannot pass when they are throwing. 5. Give kids plenty of time to practice their throwing skills!